Situated close to Covenant and Bells University respectively, BEZER HALL AND HOTEL is sited at Km 37 Lagos - Abeokuta Expressway Adalemo, Ota, Ogun state. This hotel offers guest with modern and comfortable accommodation. 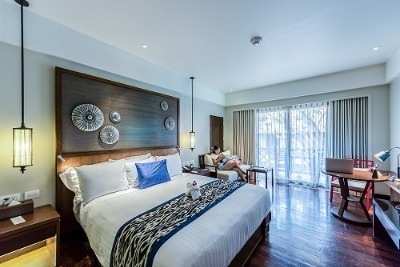 Every room is furnished with an air conditioner, refrigerator, flat screen TV with cable connection, work desk, in-room safe, sofa, king sized bed and tea/coffee maker. The ensuite bathroom is equipped with a bathtub/Jacuzzi and complimentary toiletries. The hotel rooms are categorized into standard, deluxe and twin rooms. The restaurant serves local and international cuisines, there is an option of room service. The bar is well stocked with varieties of beverages. This hotel is equipped with a ultra modern event hall and conference center. Dry cleaning, airport pickup, car hire and concierge are additional services available at a surcharged fee. Onsite parking space is ample. The premises is guarded by highly trained security men and CCTV cameras are installed at strategic positions to ensure maximum security. Bezer Hall and Hotel is a budget hotel in Ota, Ogun. I enjoyed every bit of my stay at Bezer Hotels - the room I stayed in was not only well furnished and clean, the facilities were adequate except for the TV stations which were not too clear. Bezer Hotel is such a nice place. I enjoyed my stay there, all I needed for a great and pleasant stay was made available except for the fact that there was no pool which made my son angry. We also did not get breakfast which I think guests should be entitled to. Overall, my stay was pleasant. Have nice pictures of Bezer Hall and Hotel?